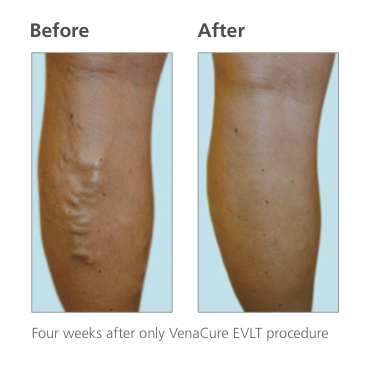 The VenaCure EVLT® procedure is a non-surgical treatment method that uses targeted laser energy to seal the vein shut, treating varicose veins directly at their source. More than half a million people have been treated with the VenaCure EVLT system worldwide, which has now become the standard of care in the U.S. for the treatment of varicose veins. If you have any questions about the VenaCure EVLT procedure, please contact our practice to speak with our patient coordinator.